Description: Up to 3cm long. 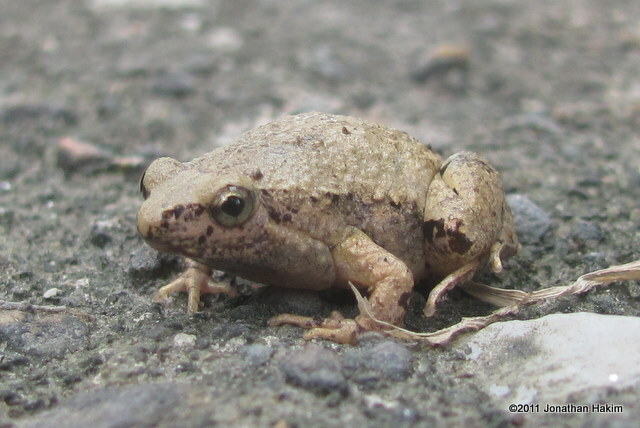 A small, squat frog with a pointed nose that gives the entire body a triangular shape. Light brown, reddish-brown, or gray on top with an “ornate” dark marking on the back. The relative color and shape of the marking can be highly variable. Some individuals have a series of thin lines outside the markings that mirror it. 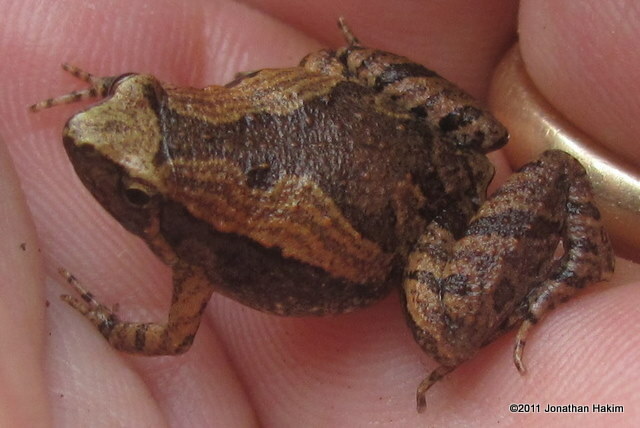 Often has a light stripe on the side from the eye to the leg. Underside is creamy white. 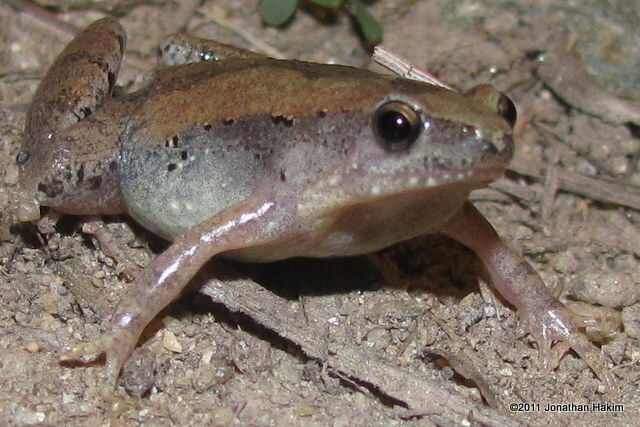 Tadpoles are nearly transparent with a “guitar” shape and a protruding mouth. Call: Its call is quite loud for its size, a series of short staccato sounds in a row that are reminiscent of an insect. 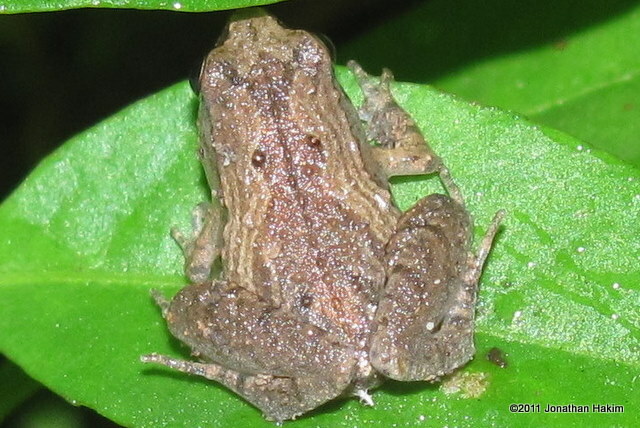 Similar Species: Inornate Froglet is flatter, has distinct black markings, and will hop around like a flea when exposed. 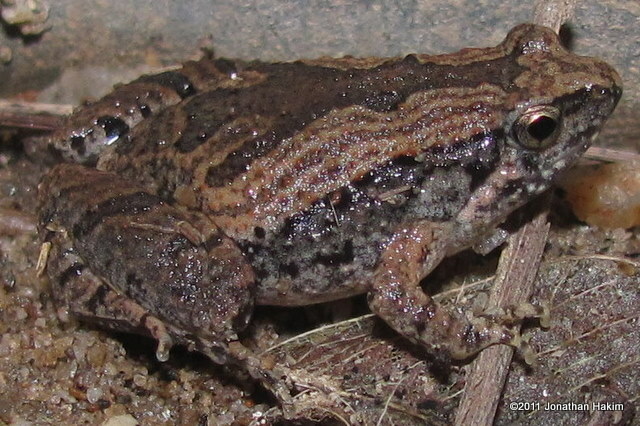 Darkside Narrowmouth Frog has dark sides and lacks the marking on the back. 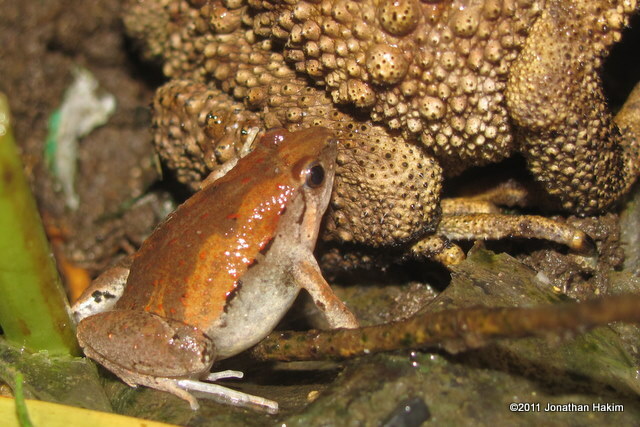 Asian Painted Frog is larger and heavier with a broader snout. Habitat: Found in a large variety of moist habitats, including forest, grassland, wetland, rice fields, parks, empty lots, and gardens. 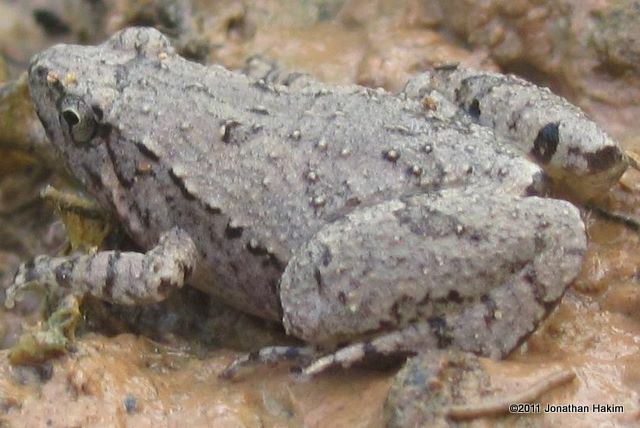 Hides under cover during the day, coming out at night or during rain. Breeds in rain puddles, ponds, and other shallow bodies of still water. 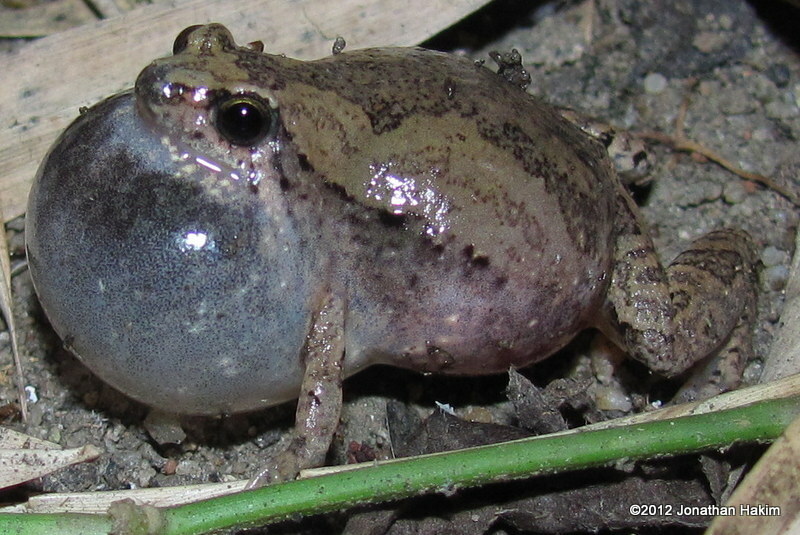 In my experience it is often found in areas with temporary water sources, while its close relative the Darkside Narrowmouth Frog is more often found in areas with permanent water sources. Contribution to the ecosystem: Helps control ants and other small insects. Provides food for birds, snakes, lizards, larger frogs, and even large insects and arachnids. Conservation status and threats: Because of its large population and ability to utilize a range of habitats (including those affected by humans), it has no conservation threats at this time. 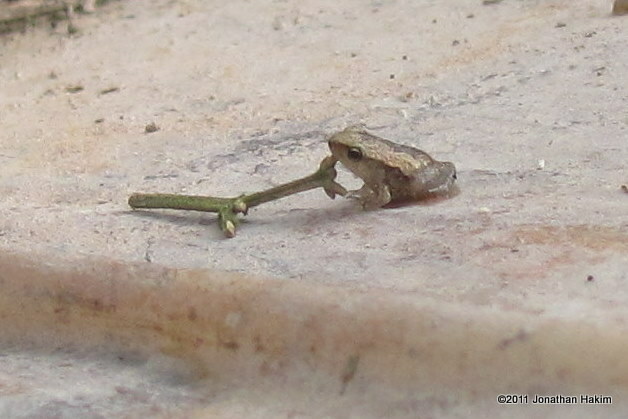 Interesting facts: This species, Microhyla fissipes, was formerly thought to be part of another species, Microhyla ornata. 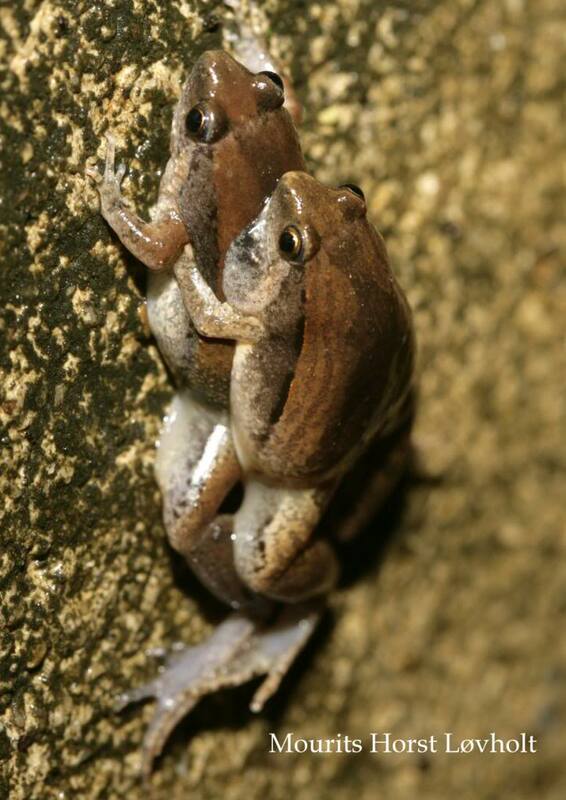 In 2005 scientists studying the genetics of the frogs determined that they were two separate species, with Microhyla fissipes being found in China and southeast Asia, and Microhyla ornata being found in Bangledesh and northern India to Pakistan.